Thick blusher brush. Thin eyelash brush. Eyeliner. Kohl pencil, etc. Everything in its place. Elegant, white calfskin with contrasting chocolate brown felt. 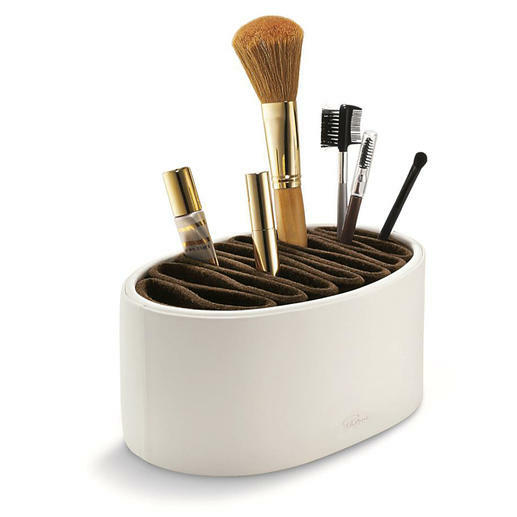 The flexible wavy insert in this luxurious utility box keeps even individual brushes and pencils neat and upright. The flexible felt insert perfectly adapts to the contents. And if you like it can even be taken out and re-folded to suit your needs depending on if you prefer openings which are narrower or wider. Also perfect to hold larger items such as your glasses or mobile phone while you take a shower. The soft material protects delicate lenses and displays against scratches. Stylish and decorative – in the bathroom, on your dressing table, hall table, etc. Measures 20 x 13 x 10cm (7.8" x 5" x 4") (L x W x H). Weighs 370g (13 oz). FLIP design by PHILIPPI. Quality stylish very useful item. Easily adapts to the sizes of items you wish to store.